When was the last time you thought of your life as a “vanishing mist,” as James described it in his epistle? If you are young, it’s likely the thought has never occurred to you. If you have passed age 50, you are probably thinking about it more often, especially when your memory gets “misty” sometimes! That’s certainly true of me; as a young man, I gave the brevity of life no thought at all; today, as a “older” man, I find myself pondering this sobering truth with increasing frequency. Kay has been doing some journaling and memory book projects from old photo albums of our family. When I look at pictures of our four daughters growing up, and Kay and I at that age, I am amazed at how quickly the time has been passing. I remember that many parents who were older than Kay and I would say things like, “They’ll grow up before you know it!” But who had time to consider an idea like that? We were busy raising four children! Well, I sure do consider it today, and I realize that the years are racing by and life on this earth is rapidly moving toward an end. There are two things this truth should do for the Christian. 1. It should challenge us. We are all dying at the rate of 60 seconds a minute, and so we should be busily engaged in doing all God has called us to do with all He has given us to do it with. Jesus cautioned us, “The night is coming when no one can work” (John 9:4), and that “night” could come upon us today . . . which should challenge you and me to get the most of every hour God has given to us. Have you ever noticed how David answers this question in Psalm 39:5. “Verily, You have made my days as handbreadths (A handbreadth is a biblical unit of measure equal to 3 inches – Exodus 25:25; 37:12; Psalm 39:5), and my age is as nothing before You; certainly every man at his best state is but a vapor. Selah. Surely every man walks about like a shadow; surely they busy themselves in vain; he heaps up riches, and does not know who will gather them.” David says that man’s life is not very long and is uncertain. But David says more than that, he declares that every man’s life is characterized by these realities – Princes, kings, philosophers, the strongest, the healthiest, the ablest, the most virtuous: David says that every man at his best state is like a vapor … even when he is in the prime and glory of his life, when he is most healthy and vigorous, when his eyes are clearest, and his muscles are firmest. Do not overlook one more emphatic word which David sets in the beginning of this verse, “Verily.” He is writing as if he were quite sure of it, something that all men experience at some point in their life. We could also consider how Job speaks of our life. The Bible says in Job 9:25-26, “Now my days are swifter than a runner; they flee away, they see no good. They pass by like swift ships, like an eagle swooping on its prey.” Oriental kings employed swift-footed runners to deliver their messages and fast ships to deliver their cargo. We ought not to watch a fast runner or boat without remembering the quickness and brevity of our lives. But Job is not finished. He also compares his life to “the eagle swooping on its prey.” Job goes to great length to remind us of the speed at which life flies towards its end. Because life is so short, frail, and uncertain, God’s challenge to us is “so teach us to number our days, that we may apply our hearts unto wisdom” … “Oh, satisfy us early with Your mercy, that we may rejoice and be glad all our days!” (Psalm 90:12, 14) Only through the redemptive work of Jesus do we find substantial, certain, and forever life. Since death is hastening, hasten yourself until you have found a refuge in the cleft of the Rock of Ages, and are safe in the arms of Jesus. 2. It should comfort us. Because life IS so brief, whatever storms we are facing and whatever waves of challenge are sweeping over us will soon pass away. Before we know it, we will be living on the other side of the grave, where there will be no more storm winds blowing, no more challenges crashing upon us, no sorrow to burden us, nor struggle confronting us. Whatever you are currently going through, you are going through it. So the key to accepting the truth that your life truly is a vanishing mist is to live in the light of eternity. We should be challenged to come to Jesus, make the most of every moment (because only what is done for Christ will last), and comforted in knowing that those moments that try men’s souls will soon come to an end. he Lord Jesus Christ is many things to His precious people . . . In the times of the Old Testament, only a very special few had the privilege of being designated as friends of God. The Bible describes both Abraham (James 2:23) and Moses (Exodus 33:11) as “friends of God.” The Lord referred to David as “a man after My own heart” (Acts 13:22). But all that changed through the work of Christ on the cross. When the veil in the holy temple was torn from top to bottom on fateful day, everything about our access to God changed! Just as it was for Adam and Eve in the Garden of Eden. In John 15:15, the Greek word used for “friend” is much deeper than our general understanding of the word friend today. Jesus was not talking about a casual, “Hey, how-ya-doin?” relationship, but rather a deeply intimate covenant friendship that is marked by unconditional love, unwavering devotion, and total trust. Does that describe your relationship with Jesus? One of the best ways to demonstrate that we are pursuing this kind of intimate relationship with Jesus is by the amount of time we spend with Him. Is time with Him simply an item on your “things-to-do” list, to be checked off each day? Or is He sitting atop the throne of your life as your highest passion, pursuit, and priority? To be sure, Jesus wants us to have a daily time of devotion with Him, but that is only the beginning. He wants all of us! He wants to be invited into every aspect of our lives. He wants us to be focused on Him when we rise up, when we lie down, when we walk along the way, and when we sit down to rest (Deuteronomy 6:4-9). Please don’t think I am telling you to get away from your daily “quiet time” with God. It is good to carve out a specific portion of each day to spend concentrated time with our Lord … but remember that this is only the starting line, not the entire race! We will develop a friendship with Jesus that will surpass all others! This verse is toward the end of 1 Samuel 17 which recounts the story of David and Goliath. The giant Goliath was far bigger, much stronger, and vastly more experienced and skilled in battle than was David. Goliath had every conceivable advantage . . . The giant went into the battle in his own strength; David went into the battle in the strength of his God. History tells us who prevailed. David uttered “The Believer’s Battle Cry” on that day, and it is to be our rallying cry every day of our lives: “The battle is the Lord’s.” And if the battle is the Lord’s, our victory is already assured. As the apostle Paul would write more than a thousand years later, “If God is for us, who can be against us?” (Romans 8:31). To the watching world, the giant Goliath was “a lock,” a sure winner. Even Israel’s King Saul was greatly afraid of this giant of a man, who harshly blasphemed God and challenged the Israelites for forty straight days. But David, who had never set foot on a battlefield before, knew that the battle was the Lord’s; it didn’t matter how big, how strong, or how experienced Goliath was, because God was infinitely bigger, stronger, and more able than the giant! So . . . what giants are you facing today? What in your life has come up against you that is causing you to shrink back from all that God is calling you to be? The armies of Israel trembled and forgot the power of God when they were confronted by the Philistine giant; you and I are likely to forget God also. The Israelites looked fearfully at the sword and the spear in Goliath’s hand, rather than looking to the God of their salvation. We often do the same thing. If we keep our focus on the size of the giants we are currently facing, the size of our God will shrink. But if we keep our focus on God, as David did, every giant that comes up against us will shrink before our eyes and God will give us glorious victory! Regardless of the challenges you are facing today in your professional or personal life, the battle is the Lord’s, and He has promised never to leave nor forsake you (Hebrews 13:5). You can advance confidently toward every giant that comes up against you, because the battle is the Lord’s and He has promised to strengthen you and help you and uphold you (Isaiah 41:10). God did not bring you this far to leave you in defeat. He will carry you past this challenge and all the way into glory. Elsewhere in the Psalms, we read . . . Greater is the power that is in you than any power that comes against you! As a child of the Most High God, do you fully understand the scope of the story you have been engrafted into? Many people don’t. Let’s take a look. In the beginning everything was good (Genesis 1 & 2). In the Garden of Eden everything went bad … Sin, Satan, and death took center stage (Genesis 3:1-13). In that same Garden, God promised to send us a Redeemer (Genesis 3:15). 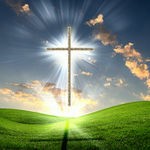 For centuries, all creation longed for this promised Redeemer who would come and take everything bad and make it good. This Redeemer finally came in the person of Jesus Christ. During His brief stay on earth, He healed the sick, gave sight to the blind, made the lame walk, raised the dead to life, and preached the Gospel to everyone around Him. Then He did what only He could do: He went to the cross to take the place of sinners – sinners like you and me – and pay the penalty for all our sins in full. And if that isn’t amazing enough, it got even better on the third day, when a dead man came alive, rose up, and walked out of His grave! Christ’s resurrection is God’s stamp of approval on His sinless life and sacrificial death. Jesus has achieved victory over sin, Satan, and death itself. And before He ascended into heaven to sit at the right hand of God the Father, He commissioned His disciples to take His Good News and preach it to every creature, both near and far. And this, my friend, is a glimpse of the scope of the greatest story ever told, a story that has been given to those who have trusted in Jesus as Lord and Savior. His redemption and calling gives our lives purpose, meaning, and significance. We have been given the great privilege to be His ambassadors in this world; we are called to share His Word and teach His truth. So . . . is the life you are living right now reflective of your understanding the scope of His story? We have been given the words of eternal life to share with all those with whom we come in contact. We have been given the authority to speak these words into the lives of others. And we have been given the promise that God’s Word will not return to Him empty, but it will accomplish what He desires and achieve the purpose for which He sent it. (Isaiah 55:11). The scope of His story is absolutely spectacular! As we preach the good news of our grave-conquering King who promises eternal life to all those who believe in Him by faith, we can be confident that He will accomplish His perfect purpose: to graft others into the scope of His glorious story of amazing grace. Rejoice in this marvelous truth! Often initiated by uttering the phrase “Give me five,” the high five is a hand gesture in which two participants raise their hands and slap open palms together as a sign of celebration and/or encouragement. At First Baptist Church, there is a lot of high-fiving going on with both the young and the old; we are excited about what God is doing! God sends encouragement to His people in a variety of ways and forms – through people, places, things, and events. Sometimes we are encouraged by the presence of an old friend . . . by a familiar place . . . by a sound, song, or sight. Encouragement is all around us if we will but look for it. And we can find no better place of eternal encouragement than in the Scriptures themselves. The Word of God is a treasure trove of total truth that brings with it good hope and great peace, which are realized through a growing knowledge of our Lord Jesus Christ. If you are feeling weak today, go to His Word and He will give you strength (Philippians 4:13). If you are feeling low today, go to His Word and He will lift you up (James 4:10). If you are feeling anxious today, go to His Word and He will give you the peace that passes all understanding (Philippians 4:7). If you are feeling lonely today, go to His Word and He will pour His presence into you (John 14:18). If you are feeling sick today, go to His Word and He will be your healing balm of Gilead (Jeremiah 8:22). There is no end to the water of refreshment in the well of His Word! Our God is an awesome God who offers a never-ending supply of supernatural encouragement for His people. Whatever ails you today there is comfort to be found in His Word. Cast your care upon Christ today, weary traveler, because He cares for you and stands at the ready to give you a “holy high five” that will encourage your heart and strengthen you in every good deed. So you see . . . you have His Word on it! The dictionary definition of complacent is “to be contented to a fault; self-satisfied and unconcerned, especially when accompanied by unawareness of actual dangers or deficiencies.” Sadly this describes far too many in the church today. They have grown so comfortable with their spiritual standing that they have become complacent, to the point where they are living out a Christ-less Christianity. Contentment is another thing altogether. When the apostle Paul said he had learned to “be content,” we misunderstand what he meant if we believe he was equating “content” with “satisfied.” Sure, we all need to learn to be content with what we have, but that is to be in the context of pursuing what God has set before us. The rhythm of redemption is not to rest on our laurels and succumb to the cruel current of complacency. We are to continue pressing on until our race is over. In Paul’s contentment, he continued straining forward and pressing on in the direction God was calling him to go. Paul knew that being “satisfied” would only lead to complacency and watering down his impact in expanding the cause of Christ. Do you think Paul was ever satisfied with the level of ministry he was accomplishing? If he was, he probably would have rested while behind prison walls. Honestly, if it had been you . . . do you think you might have sulked and pouted at this unpleasant turn of events? “Lord,” we might well whine, “I did all that great ministry for You, and this is what I get? !” Yet, we know that most of what Paul contributed to the New Testament was written while he was in chains. He never stopped pressing on toward the goal. Paul never grew complacent about his relationship with Jesus. We know that his heart continually ached to be in the presence of his Lord, yet he knew he still had work to do, because God had not called him home. Paul was not subject to the cruel current of complacency. The call to every Christian is to continually press on and pursue God’s perfect plan for our lives. And those who are His by faith know we never reach our final destination until we get to the other side. The cruel current of complacency is not to be the mark of the committed Christian. It has been wisely said, “It is far better to burn out than rust out!” Now, I am not encouraging burn out; if you’ve been around the church for any length of time, you’ve seen that happen to great men and women of God who did not find balance in life. Remember that a life without balance leads to an unbalanced life. But let me close by encouraging every member of the church to be active in playing their part, straining forward until the moment they are no longer needed . . . and that will be the moment when God calls us home. When we read the account of the horrific fall of Adam and Eve in the Garden of Eden, we may not give the proper attention to this exchange between God and Adam. I know you are eager to “get to the good part” about God’s plan to redeem man and restore him to fellowship with Him, so it’s easy to skim past one of the saddest moments ever recorded in sacred Scripture. The one who was formed by God and made for God was now trying to hide from God. Adam and Eve were created to walk with God and talk with God and rejoice in God. They were created to find purpose in His presence; meaning in His majesty; significance in His sovereignty; identity in His immutability. But after they sin we find them crouched trembling in the brush . . . and in their hiding they are denying their humanity. Made for intimate relationship with the Creator of the universe, they are now on the run from Him. Before Adam and Eve committed their act of catastrophic rebellion, their hearts filled with delight in the presence of God; after they sinned, their hearts filled with dread at the sound of God walking in the Garden. They find themselves at the beginning of a drama that will be played out until Jesus returns, a story marked by “unholy hiding” from our holy God. So . . . where in your life today do you find yourself hiding from God? Where have you been hiding from those who love you most? Life is not to be lived in the shadows; it is to be lived in the light, and that light shines brilliantly through the truths of the Gospel. You see, God knows you. He knows you fully; He has searched you and He knows you; He is familiar with all your ways; before a word is on your tongue He knows it fully (Psalm 139:1-4) . . . and yet He still loves you. There is no hiding from the One who knows everything and sees everything. And only a clear view of the Gospel can help us to come out from behind the bushes without fear of rejection or removal from the presence of God. The Gospel makes it clear that Jesus was the One who would take our place and pay the penalty for our sin. The Gospel also makes it clear that Jesus was removed from the presence of His Father during the darkest time in the history of the world: the day when the Light of the world was spit upon, scourged, and nailed to a cruel cross. And because Jesus took our place on that cross – rejected by God and removed from His presence – all those who are in Christ need never fear rejection or removal from the presence of God ever again. God loves you! He accepts you! God is for you (Romans 8:31), so it doesn’t matter who is against you . . . which means you can stop any kind of “unholy hiding” from Him and from those who matter most in your life. Think about the last time you went into hiding. You could hear His voice, couldn’t you? Of course you could! God did not leave Adam and Even in their hiding and He will not leave you either. God is in the business of pursuing rebels on the run – not to crush them but to restore them – and that includes you. Always remember: God is not pleased with you because of your performance. God delights in you because of the perfect performance of your Redeemer, who lived and died and was raised from the dead so that you could stop hiding in shadows and begin living in the warm sunlight of God’s unwavering love, which is expressed in the truths of the Gospel. If you will pause for a moment and sit still long enough, you just might hear the sound of God walking in your garden, calling out to you, “Where are you?” Come out from behind the bushes of unbelief and your unholy hiding. Go to Him. Run to Him! And you will find that, while you are still a long way off, He will come running to you, His arms outstretched and nail-scarred hands held open, just waiting to take you into His loving, healing, eternal embrace. When we read the second commandment, we may have a tendency to think this word was for a primitive people who made graven images of wood, stone, and gold. But if we think this is the limit of idolatry, we don’t fully understand the nature of our heart. then it becomes a bad thing – an idol. Take church service as an example. That’s a very good thing. But when church service becomes an ultimate thing, displacing Jesus from the throne of your life, it has become a bad thing. This happens all the time! It is one of the things pastors like me have to guard against on a daily basis. We can so totally focus on serving God that we miss God altogether. When we turn anything other than Jesus into our “god,” the blessing we seek turns into a burden that can – and often does – bury us under its weight. These “gods” simply cannot deliver on their promises because they are not God! They promise help, but in times of trouble the help never arrives. What satisfaction they may yield today steals our joy tomorrow. Only the truths of the Gospel can fill the longings of our hearts . . . and keep them filled too! The Gospel makes a promise: to meet you in your place of need and give you what you desperately need, but could never earn or deserve . . . and it delivers on that promise every time. Everyone is living for something. And whatever that something is, it is your master. It consumes you. It enslaves you. In this life we will always be confronted with two choices. We can bow down to the one true, living God or we can bow down to something else. One will always bring life; the other brings death. So . . . do you have any graven images in your life today? Is there something you might have missed seeing? Sexual immorality is easy to see; service to God is much more subtle. Becoming a slave to financial success sounds a lot like worshipping a golden idol; making our children the ultimate thing in our lives seems like such a good thing . . .
May the Lord purge us from our idolatry and lead us further up and further into our vision of the cross and the love that held Jesus on it. That is the only love that will deliver what it promises – and it delivers every time! I used to dread opening my Emails. My inbox would be full of communications from a host of different sorts of people. On a normal day about forty emails would need to be read and quite a few of them required a response. However, now I have a different attitude about this. I actually find myself eager and willing to linger a little longer over some of that electronic correspondence. Over the years, I have heard from people that God used to remind me that He still has work for me to do. A dear sister in Christ who got saved during the time I was her pastor wrote me to let me know that she was thankful to the Lord for my teaching ministry through which God led her to have a hunger for God and that she is now leading a Women’s Bible Study. What a joy for me to hear that! Along with hers, I have received update updates from a missionary with whom I have covenanted in prayer concerning his life work and family needs. They may be on the cusp of a breakthrough and I wanted to encourage him that I was in his corner. When reading their emails I recognized afresh that we serve God through connecting with others. Throw a pebble in a still pond and you will make a ripple. Something you do on land affects changes over a much broader area. A simple act of exertion can change the whole dynamic of that little body of water. So it is with investing your life in others. Some of you who read this today do not believe that you give out your own personal ripple. Your lifework may not be big or neon or public, so you don’t think you are making a difference because there is a lack of results, that thing that the Bible calls fruit; you wonder if you are responding in a significant enough way that honors the amazing work Christ has done in your life. You know you are casting your pebble in the pond, but it seems to sink straight to the bottom in the absence of a splash. You wish you could do more, or do it in a different venue, or at least see some different results. You sometimes think about walking away from your pile of pebbles because you just don’t know how many more you can bear to throw into the pond without experiencing some results. It’s important that you know that countless others have sensed the same dilemma. From missionaries to moms, CEO’s to ditch diggers, senior citizens to school teachers…everybody who has ever wanted to live for Christ knows the occasional dissatisfaction of a continually still pond that is seemingly filled with their sunken pebbles. Keep doing what God last told you to do. He never called us to fixate on results. and that is something that we may all accomplish for His glory. What if your life was meant to be put on display before an audience of One? What if He has so highly esteemed your earthly journey that He has cordoned you off with the intent of not emphasizing your value before others? Seriously, will you be content if only God is aware and pleased with what you do in the name of His Son? Believe this by faith – whether you sense a ripple or not. Keep throwing your pebbles until the voice of Sovereignty permits you to do otherwise. You are making a difference because you are being faithful to Him. Make God the sole object of your desire to bring good forth from your life. Do it for Him. Do it as unto Him. Do it with wholeheartedness. Trust His evaluation of it according to His word. Let nobody steal your reward. If God be pleased then dismiss the thought of others not esteeming your life’s value…even if that ‘other’ happens to be you today. So what’s in a number? When it comes to forgiveness . . . absolutely nothing! Jesus made it clear to Peter that asking how many times he should forgive someone who has wronged him is the wrong question to ask. Peter probably thought he was being extra-gracious. By proposing a seven-times forgiveness plan he was far surpassing the righteousness of the Pharisees and teachers of the law. In that day, Jewish tradition limited forgiveness to just three times and then you could write the offender off. When it comes to forgiveness, there is no number! In God’s economy, there simply is no limit to the number of times we are to forgive others. That is because there is no limit to how many times God forgives us. He is not keeping score and neither should we! Peter had a hard time getting past the number. How about you? Those who are keeping track of forgiveness simply do not understand; they do not fully comprehend the forgiveness they have received in Christ. When Jesus taught His disciples to pray, He said: “Forgive us our debts, as we forgive our debtors.” Really? Is that what we really want God to do? To forgive us as we forgive others? The answer is yes . . . but only if the power of the Gospel has freed us to live a life of unconditional forgiveness. Now, I don’t want to minimize the pain that the wrongs of another can cause. Some scars last a lifetime. And that is why it is so critical to pursue a deeper understanding of the Gospel, so that we can be freed to forgive. The Gospel accounts describe in excruciating detail what happened to Jesus on our behalf. And yet, while hanging on that tree, Jesus prayed: “Father, forgive them, for they do not know what they are doing” (Luke 23:34). I once heard a man say that “Refusing to forgive is like drinking poison and waiting for your enemy to die.” Jesus knew the damage of an unforgiving heart, and He set the model before us that gives us the power to offer up forgiveness and thus free ourselves from the prison of the past. To be sure, we can pray for God to deal with every injustice, which He has promised that He will do. God-centered anger is an appropriate response to injustice, because it is rooted in a concern for God and His Kingdom rather than our own. And yet it is the power of the Gospel that frees us to leave our righteous indignation at the foot of the cross. It has been said, “Unforgiveness does more damage to the vessel in which it is stored than the object upon which it is poured.” To forgive as we have been forgiven is to freely forgive, no matter how many times someone has wronged us or hurt us. And remember: God never asks us to do anything without giving us the grace to get it done.